CARACAS, Venezuela (AFP) — Venezuela and Panama on Thursday agreed to restore their respective ambassadors and re-establish air links as they sought to patch up a bitter diplomatic row, Venezuelan President Nicolas Maduro said Thursday. “We have agreed to return ambassadors to Panama and Venezuela… and resume air links from tomorrow,” Maduro told reporters after speaking by phone with his Panamanian counterpart Juan Carlos Varela. A Panamanian government source confirmed the agreement to AFP. 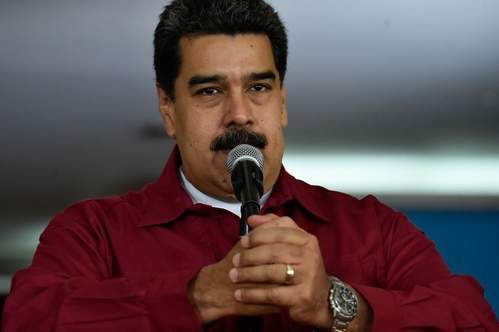 Maduro said the conversation with Varela was mediated by the Dominican Republic’s President Danilo Medina, who has also been facilitating talks between Venezuela’s government and the opposition, which broke down in February. The diplomatic crisis erupted in late March when Panama said it had added a string of senior Venezuelan officials, including Maduro, to a list of individuals deemed at “high risk” of money laundering. On April 5, Maduro’s government promptly suspended economic ties with around 100 Panamanian businesses, including Copa Airlines, one of the main carriers linking Venezuela to the rest of the region. In a retaliatory move the same day, Panama ordered Venezuela’s ambassador out and recalled its own envoy, as well as suspending flights.